I Have A Great New XO Project Idea! My name is Nancie Severs and I am not a "techie." I learned about OLPC from the CBS "60 Minutes" profile of the Laptop Project in 2007. In November, 2007, I participated in G1G1 because I liked the OLPC vision and mission and because I thought that if a child could use the XO, then I probably could too! I love my XO! I travel with my XO and act as an OLPC "ambassador," explaining the Laptop Project in response to the frequent curious inquiries I receive. 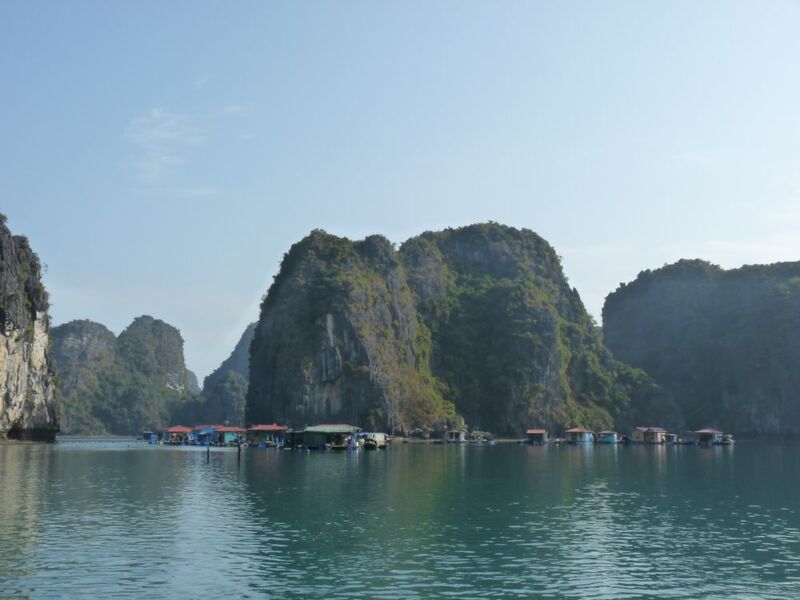 In February, 2009, while visiting Southeast Asia, I stumbled upon a floating village in a most spectacular geographic environment, part of the Ha Long Bay, Vietnam, a UNESCO World Heritage Site. I thought, this would be a remarkable site for the OLPC Laptop Project. My tour guide from the eco-tourism Indochina Junk Company, Tuyen Luong agreed. If the Laptop Project can work out in the middle of the South China Sea, it can indeed work anywhere. Now I had an idea for a new "deployment." That's what the OLPC folks call a new project site. I did not personally know anyone at OLPC. I asked myself, where do I begin and what do I do first? The Vung Vieng Fishing Village Laptop Project. The Vung Vieng Fishing Village Laptop Project is really new; it is in its infancy. You are the first to read about it as it has not even been published on the OLPC Wiki yet. In the Vung Vieng Fishing Village, there are about 50 families, between 200 and 300 residents, including nearly 100 children. Most of these families have resided there for generations. 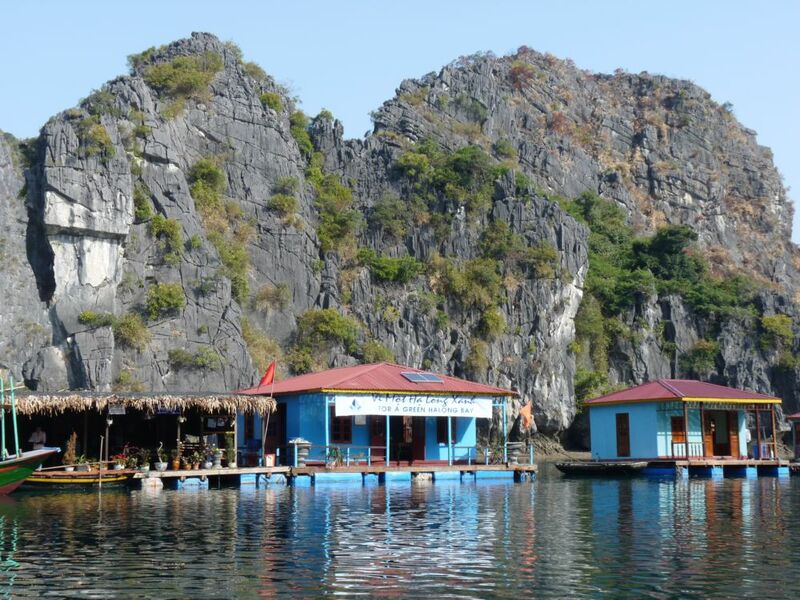 The growing popularity of tourism belies the dire needs of the Vung Vieng Village residents. The village and its residents are very poor. The people struggle to earn enough money to adequately feed and clothe their families. They are quite isolated from the outside world and yet they depend upon it and upon currency and earning ability, for supplies; food other than seafood, clothing, and even potable water. 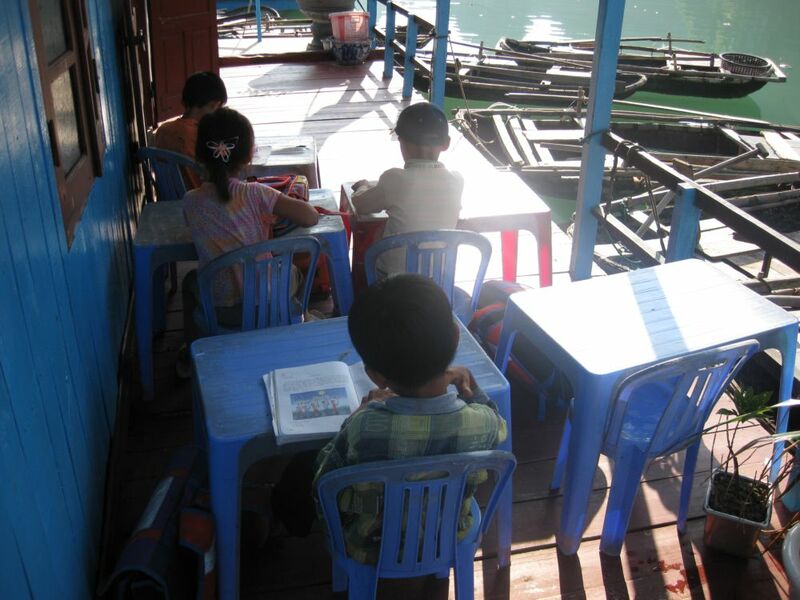 Formal education only reached the Vung Vieng Fishing Village 7 years ago! The literacy rate is low, but is improving. The few children who have managed to earn entry to school outside of the village, on the mainland are reaching the age where they can use their education and skills to help support and improve life in the village in a culturally sensitive manner. A successful, small deployment in this very unique location would be visible to visitors from many nations. It could be used as a model for the other similarly isolated villages in Ha Long Bay, and for other isolated locales in Vietnam and elsewhere in the developing world. I started with the OLPC Wiki at http://wiki.laptop.org. It is a treasure trove of information. In my spare time, I searched the Wiki and read as much as I could about the deployments of XOs to date, all around the world. I checked out YouTube and Facebook too. On the Wiki, I read that Proposals for new deployments can be sent to volunteer@laptop.org, so I emailed my newly drafted Proposal for the VVV Laptop Project to them. "Thanks for the impressive photos. Would you consider joining our support volunteering team to push forward these plans, delineating what is in fact possible? In any case, buying the laptops is generally not the issue in the end. More important: developing a sustainable, strong, self-supporting plan around school server, electricity, teachers, and regular demonstrations or publishing of your results/contributions to our worldwide OLPC/Sugar community could make you eligible for the Contributors Program -- if you're able to coordinate a solid team in Vietnam." OLPC Does Not "Give" Out Laptops. OK, so OLPC does not just give out Laptops. I am sometimes naive, but I am not easily discouraged. I joined the Support Gang and forged ahead. The Support Gangsters asked questions that discouraged me, poking holes in my plans. I needed to learn that the timeline from an idea to a "successful and sustainable" deployment is a long one. There are many complicated issues to address. 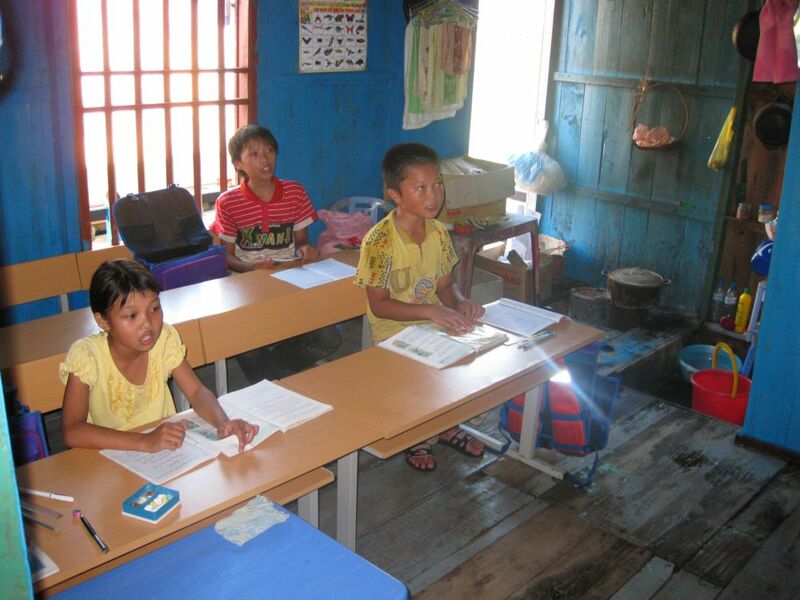 OLPC does not yet have a presence in Vietnem. Do I need permission from the Vietnamese Government? Where do I get that! Do the Vung Vieng residents want their children to have computers? Yes! :) How do I form a strong team in Vietnam? I don't speak Vietnamese and we do not have a Vietnamese Keyboard for the XO yet. How do we recharge 35 laptops and the how will we run the computer that will be the "server" in a location off the electrical grid. How will I get the computers to Vietnam and pay shipping and customs fees? What is my estimated budget? Where will the money come from? And so on and so on. One of the most helpful things I have read is a presentation from Bryan Berry. He helped start the OLPC Laptop Project in Nepal and is the "voice of experience." Help Comes From The OLPC Community. The OLPC and Open Source Software Community is a wonderfully committed group of people. I have chatted with teachers, people with technical expertise, engineering expertise, and even some who have participated on the ground in some of the many project sites around the world. I have learned that OLPC has only about 30 employees. Everyone else volunteers for this cause. The first pre-production XOs were deployed in May, 2007. Children in Cardal, Uruguay received 150 XO Laptops. Mass production began in November, 2007. Just 2 years later, there are already 1,000,000 of the little green XOs around the world. This is an impressive accomplishment for any organization, especially a new one, and one that depends largely upon volunteers. I see and appreciate the huge contribution of the Volunteer Community and of the entire OLPC and Open Source Software Community. I would really like to be able to deliver 35 Laptops to the Vung Vieng Fishing Village in Vietnam before the end of this year. The VVV Children are waiting for them! But, if XO's are delivered without proper planning, teacher training, plans for assessment and follow-up, then the project is more likely to fail than to succeed. I am hoping to borrow some XOs from the Contributors Program. I will take them to Vietnam for demonstration, planning, teacher training, and team building in the near future (at my own expense). Interested readers will be able to follow my progress on the OLPC Wiki when I formally publish this project. Every new deployment can benefit from the successes and failures of the others. That's why becoming part of the OLPC Community is so important! Is this overwhelming? Yes. Should you still consider Starting a Laptop Project? Yes. The reasons for doing this are bigger than the obstacles. Change can happen. We will help you and you can help us!